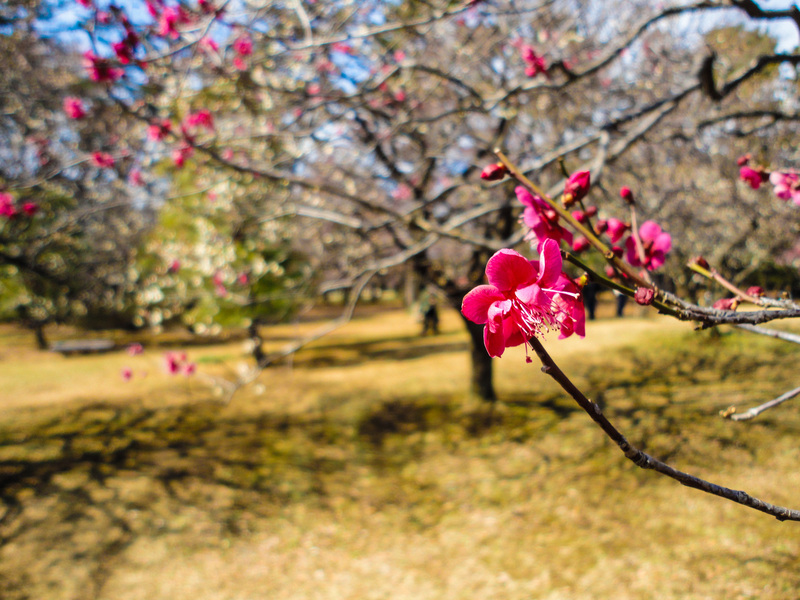 It is early March, which means that the white and pink Ume (Japanese plum) blossoms are opening up and that spring is on its way. Here in Japan people wait all year long for this display. Ume blossoms come first, then tulips, then sakura (cherry) blossoms. Some of my Japanese friends told me that Japanese people enjoy the blossom season for a few reasons: the blooms are pretty to look at, fragrant, and the event brings people together…but also that the blooming period is so short, which reminds us of our mortality. One man I know likened the ume and sakura seasons to loving a gorgeous woman, only she passes away quickly and at the prime of her life. You enjoy the blooms while they are here, but you also know they do not last long so you must make the most of the time you have with them. 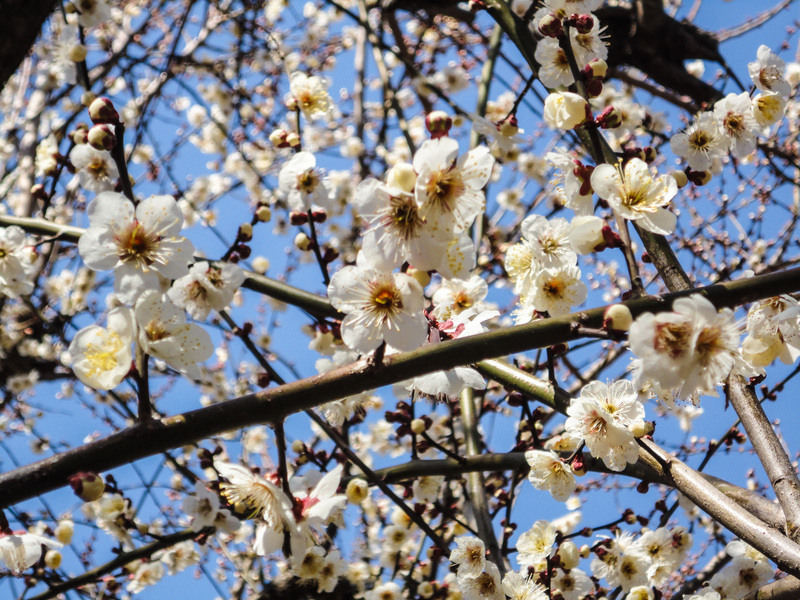 Recently I learned that, similarly to how many Americans are divided by sports teams, that many Japanese prefer viewing ume blossoms over sakura, and vice versa. Being that I’m a foreigner I’m crazy for both types of blossoms; I want to see them all! I made a list of popular ume viewing locations that I found online at websites like Time Out Tokyo and created pins on our collaborative Google map to make our adventures easier to plan; David’s schedule is very difficult to adventure with, so we have to plan wisely. Last weekend David and I were able to get away from Fussa to visit Koganei park to view the ume blossoms since they typically appear late February. However, last month Tokyo got the biggest snow storm its had in over 16 years, so the ume blossoms seem to be delayed due to the bad weather. Koganei park did have a few dozen trees that had some blossoms showing, but you could see that many buds were still closed. We probably should have waited another week, but I was going crazy knowing there were blooms out there that I needed to see. Always the hipster, I had to be among the first to ume blossoms. I think I’m also getting “spring fever,” or what some may call “cabin fever” due to David’s taxing work schedule. I keep feeling the nagging urge to get out and explore! It isn’t as fun to go experience Japan alone, but today was my breaking point and I was determined to cross off some of my “must-see” blossom viewing points on our Google map, even if I had to go by myself. I helped at the local English speaking coffee shop and afterwards opted to go to Hamura zoo. I thought that there might be some ume trees, and I was right! I felt a little strange going to a zoo by myself at first, but then I saw other people who were there alone, so I didn’t feel too weird after awhile. Though, I did notice that the other solo viewers were older men with giant cameras. Not only did the zoo have a great array of local and exotic animals, there was also a dozen or so ume trees in bloom that were very nice. Many people, local and foreign, will tell you that the Hamura zoo isn’t that great, but if you are looking for the standard fare of zoo animals with a nice park area you should visit. I found it to be clean, quiet, and while some animals had small cages the cages were clean and the animals looked to be in healthy condition and in good spirits. Plus it only cost 300 yen for each adult and 300 yen for parking. I was able to spend almost 2 hours there watching the animals and looking at the the mini-bamboo forest and ume trees. I saw a few families having picnics on the grass, a father and son playing catch, and older Japanese people sitting at park benches in this area- all were enjoying the beautiful weather and lovely ume. I wished I had brought thought to bring a blanket and lunch so I could sit under the trees and relax, too. I noticed that while other people were enjoying the blooms that I was only person taking pictures. My guess is because the main focus here is the zoo, but I didn’t mind that I looked like the crazy foreigner who has never seen ume because it’s true! I have never seen Japanese ume before now, and I want to enjoy every moment I can. Tomorrow morning after I work at the cafe I want to go to a larger park where I can relax on the grass and read or write for a little while. There are just so many ume viewing locations to visit, and so little time!